Fred Conlon takes garage finds like wrenches and valves to build this captivating party guest. Meet Moonshiner. He's come from the future, where robots and humans happily sip adult beverages together. So feel good inviting this captivating guest to your next party. 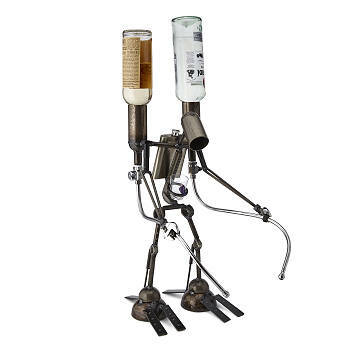 Fred Conlon takes garage finds like wrenches and valves to build him, with two valve-operated dispensers for wine or liquor bottles and a shot glass holder. Our favorite detail: A decorative flask "backpack," because that's our kind of rocket fuel. Handmade in Utah. Item should be wiped clean after use. Not designed to be washed with water or dishwasher. The "Moonshiner" is made from surplus, seconds, and scrap materials. It has clear powder coat finish. The wrench components of the "Moonshiner" are reclaimed/recycled. The compinent metal that is used is a C grade material. The surface imperfections from this steel give the "Moonshiner" deptha nd character. The plumbing components (valves and stems) are made of brass and stainless steel. This is a made-to-order item. You will receive a pre-paid shipping label and envelope to mail your materials to the artist.You will be provided with a ship date for the final item after the artist receives your mailer. This item typically ships 3 weeks after the artist receives the mailer.At this time, this item cannot be shipped to P.O. Boxes or to APO/FPO or US Territories. Contact custom@uncommongoods.com with any questions.